Zombies prepared to take over the airwaves!!! They are said to have been HFpackers (Hams who hike trails with backpack radios and antennas) who fell victim to a Zombie Apocalypse which struck the Silicone Valley during PACIFICON a few years back. This catastrophic event caused the HFpackers to become real mutant Zombies theirselves. This mutation drives these Zombies to hunger, not for flesh, but for RF energy. Most of the time these Zombies are able to walk among us, un-detected. Once a year, on the eve of the great Pacificon Zombie Apocalypse, these poor creatures become fueled with RF energy and their ghastly transformation as Radio Zombies is exposed. 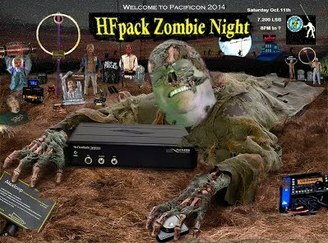 In what is now an annual Pacificon tradition, the HFpack Zombie Radio Group will once again host Zombie Radio Night on Saturday from 8:00pm to 12:00pm. It is NOT necessary to walk like a zombie! Look for the Zombies or call "CQ ZOMBIE" on Lower Side Band at 7.200 Mhz beginning at 8:00 pm PDT. There will be two Zombie Night net control stations operating both phone and CW modes. Anyone can check into this joint Norcal QRP / Zombie Radio Group.